I was excited to see what these would smell like, as I really like Philosophy fragrances for a clean, fresh everyday scent, one of my favourites being amazing grace! When I look for a scent I don't like anything too overpowering and tend to go for the more sweeter scents (plus a lot of fragrances just don't smell right on my skin!) so this seemed like something that would be just down my street. So your probably thinking okay tell me what they smell like! 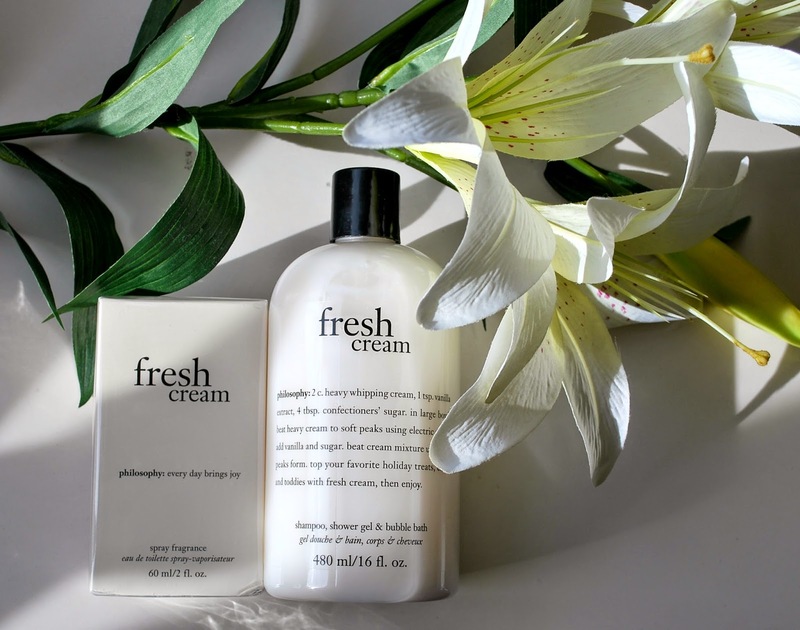 So firstly, just think of everything sweet and tasty in a bottle, in particular the name - fresh cream. The fragrance includes fresh whipped cream (of course), white chocolate, buttercream, almond blossom and many more yummy, great smelling ingredients! It smells just like it says, as soon as I put it on, it reminds me of going to a fair and smelling candy floss, sugar and chocolate, so yes it is very sweet (almost good enough to eat!) I love a sweet smelling fragrance, but when I first used these products I did think wow that is very sweet, maybe even a little too sweet! But once it settled on my skin I thought it was beautiful! The bubble bath can also be used as a shampoo and shower gel, which I find a great idea. The smell is more subtle than the fragrance you can either use that on its own and your left with a slight scent on the skin or add the fragrance, making it much longer lasting. It is probably best to layer the two together as you can definitely tell the difference, when I use the fragrance on it's own it doesn't tend to last that long unfortunately with it being really sweet and more of a natural, fresh scent. I do think this range is either a one you can either love or hate! When I first tried it I was unsure but once it settled I loved it and it has been something I have been wearing everyday since. so if you like the sound of smelling as sweet as cream and candy, definitely give it a go! Sounds yummy! Definitely need to buy this Philosophy collection. Pop of Green | St Patrick's Day!